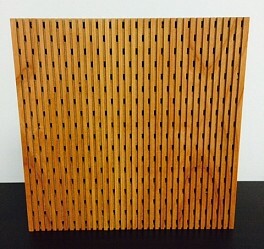 An acoustical wood planking system for creating natural wood finishes on walls or ceilings that control reverberant sound energy. Planks have tongue and groove edges for blind nailing to furring strips over an acoustical core material. Use where reduced sound reverberation and improved acoustics are desired in a space. Meet acoustic goals with the beauty and durability of natural hardwood.